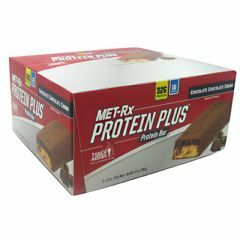 AllegroMedical.com presents The MET-Rx Protein Plus - Chocolate Chocolate Chunk Meal Replacement Bar. MET-Rx's Creamy Peanut Butter Crisp Protein Plus bar contains the exclusive METAMYOSYN protein formula and rich taste. Packed with 30 - 32 grams of protein, depending on flavor, the protein plus protein bar is perfect for supporting muscle and an active lifestyle. For best results, drink at least 8 fl oz. of water or other liquid with this bar.